Biafra as a nation has suffered incalculable losses in the course of its struggle and fight for freedom and independence. The land of the rising sun – Biafra, is a nation forced into the contraption called Nigeria. Nigeria is a contraption created by the British colonial authorities, it is a forced merger of various distinct nations constituting Biafra in the East, Arewa or the Muslim Emirates in the North and Oduduwa in the West also the middle belts. Since the arbitrary amalgamation of these irreconcilable nations in 1914, by the British colonial’s lords, things have changed from bad to worse for Biafrans. It has always been a history of one massacre to the other. Biafrans have been killed severally for no fault of theirs rather than for being gifted, creative, talented and industrious. The killing of Biafrans took place in the Northern city of Kano in 1953, where hundreds of innocent Biafrans were slaughtered in a pogrom backed by the government of Nigeria. The killing of Biafrans continued up till 1966, when another holocaust was meted on Biafrans in the Northern part of Nigeria and some parts of the West. Biafran men, women and children were killed and slaughtered under the watch and supervision of the federal government of Nigeria and the world looked on and did nothing. On the 30th May 1967, The Republic of Biafra was declared by His Excellency, Dim Chukwuemeka Odumegwu Ojukwu. But the Nigerian government were bent on killing and exterminating Biafrans because they lacked the sanctity to respect and honour Biafra’s right to freedom and self-determination. In his barbarism, the then Nigerian head of state – General Yakubu “Jack” Gowon, declared war on Biafra for daring to ask for freedom from the murderous and atrocious entity called Nigeria. Biafrans had no choice other than to fight the battle for survival. As the fighting raged, Britain, Egypt, Russian, Sudan, and many other Arab nations joined forces with Nigeria to commit one of the worst genocides in the history of mankind. The genocide spearheaded by the British Empire claimed the lives of more than 3.5 million Biafrans including women, pregnant women and children. Worthy of note is that the British Government then, under Harold Wilson committed the worst genocide in history in Biafra land, and up till date no official statement of remorse from Britain has been recorded. The blood of innocent Biafrans – women and children, are crying for justice and their spirits will not rest until the cause for which they were massacred is accomplished – the restoration of Biafra as a free and independent nation. On the 14th of October 2015, Citizen Nnamdi Kanu – the leader of the Indigenous People of Biafra (IPOB), was kidnapped by the Department of State Security (DSS). This led to various protests by Biafrans worldwide, demanding for the immediate release of the IPOB leader, with placards written “Free Nnamdi Kanu” and “Free Biafra.” During those protests in Biafra land, the Nigerian Armed Forces would continually open fire on unarmed peaceful Biafran protesters who are agitating for the freedom of Biafra and that of their leader – Mazi Nnamdi Kanu. Considering the predicaments that Biafra has been through and in their tradition of honouring and appreciating honourable and selfless services, decided to honour all the people that paid the supreme price in that genocidal war against Biafra, all Biafrans as well as non-Biafrans who died defending Biafra. We also recognise all living Biafran and non-Biafran heroes who fought for the freedom and independence of Biafra between 1967-1970. 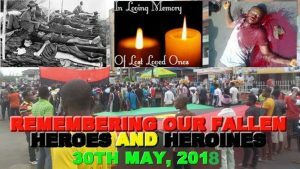 Biafrans shall on the 30th of May 2018, remain indoors and honour our fallen heroes and it shall be fruitful, and in the end, Biafra shall have freedom. For the murderous Nigeria government, which has taken it upon itself to continue to subjugate and to slaughter unarmed Biafrans, it has to remember that those who shed blood must pay for them. Nigerian Government cannot kill us and at the same time, stop us from mourning our dead. We have every right to pay respect to Biafran heroes and heroines who paid the ultimate prize for the restoration of the sovereign state of Biafra. They called on all grown men in Asaba to gather and shout One Nigeria, and as they gathered, Murtala Mohammed and his gang of Nigeria evil soldiers opened fire on thousands of these civilians, killing almost all of them instantly. They inspected the corpses and shot seeming survivals in the head at close range. It was very few that made it alive. Men weren’t buried because there were scarce men to do the job. Imagine the stench, the smells and the diseases this caused Asaba people and its environs. Women lost husbands, brothers, uncles and friends. There were no much men to marry the teaming young ladies left in Asaba. The method used in Asaba were quite different from what happened in other places like Ikwerre. In Ikwerre no one was gathered to be executed. They were simply told to deny being Igbo. They rush out in their numbers and started denying being Igbo. They fall in love with the letter ‘R’ and started corrupting their languages, names of villages and towns with the letter ‘R’. Umuokoro became Rumuokoro, and Umuobi became Rumuobi. In no distant time almost all the kids growing at that time lost their identity or suffered identity crisis. became South East and others South-South. As we celebrate the 51 years of Biafra, we can’t forget the massacre of Igbos in Asaba, the effort of every Biafran who willingly joined the Biafra army and those conscripted into standing tall for Biafra. We can’t forget all the children that suffered Kwashiorkor because of the blockade policy of Gowon and Awolowo. We can’t forget those that were taken to Gabon for treatment but never made it back. We can’t forget the mothers that were with child during the war, mothers who have to breastfeed their children when suffering from severe malnutrition. Not forgetting the girls brigade, those gallant women who fought alongside men, in that war of survival. How can we forget those killed in Aba and their bodies mutilated and dumped in borrow pit by Buhari’s military. You are not forgotten those killed in Onitsha. That young little girl that was shot down by careless military men on her way to school can’t be forgotten. The undergraduate lady that met her death on her way back to school in Onitsha can’t also be forgotten. Those forced to drink mud water until they died, those killed in primary school at Aba and those killed in the palace of HRH Igwe Kanu, we assure you all of our continuous remembrance. Many has sacrificed a lot. We can’t forget. We remember you all. When SIT-AT-HOME, it’s for all of you. For all we suffered together. Biafra is here, it’s certain. Sit at home we must! Oji River killing of hospital staff and patients: 2nd August 1968, Nigerian atrocities in Biafra; in a hospital outside Enugu, the vandals shot all fourteen Biafran nurses who stayed behind and then went down the wards killing the patients as well. And sadly enough, according to Mr. C. N. C. Nnolim, these Biafran civilians massacred by the Nigerian soldiers were not even buried but left in the open air to be devoured by vultures and wild beasts. Those that was killed in National High School in Aba February 2016, those of Nkpor in Onitsha province, and those that was killed in Ishiala Ngwa on their way to Ibeku in August 2017. Also, not forgetting the last words of that 18 years old boy that said that his concern is not his death but we should not let his death to be in vain, and not forgetting the tea centre man that was killed inside his store by so called accidental discharge of military men in Ariaria International Market Aba. Even that volunteer man from Enugu who was killed with a poisonous bullet, and those that ran into swamp and didn’t come out in Bayelsa, not forgetting those ones that died in the platform of MASSOB under Uwazurike. I can’t forget the effort of Chimaobi (Waka-waka), and that of London Coordinator (Uzu Awka) who spent three months in prison. To all Biafrans who are still in the dungeon, we owe them nothing but just 12 hours of Sit-At-Home 30th May 2018.